DAYTONA BEACH, FL - NASCAR's 50-year history can be told from many different perspectives - track history, promoter history, or manufacturer history. But the one that adds the color and drama, and ignites our imaginations, is NASCAR history seen through the eyes of those who made it on the track. As part of its 50th Anniversary celebration, NASCAR is honoring its past and present by naming its 50 greatest drivers. This list is a "Who's Who" of the greatest talent to ever strap themselves into race cars at NASCAR-sanctioned events. From the dirt ovals that hosted NASCAR's early races to the modern speedways of today, the list of the 50 greatest drivers begins with NASCAR's first champion, Red Byron, to 11 active drivers of today. The 50 drivers are not only from the NASCAR Winston Cup Series, as it includes Modified champions like Richie Evans, as well as division champions like Ralph Earnhardt, Jack Ingram and Hershel McGriff. Twenty-two of these drivers have won at least one NASCAR Winston Cup Series championship, and 13 have won more than one. Enhancing the sport's long tradition of family, there are five father-son combinations among the 50. The drivers were introduced this evening at Daytona USA, the "Ultimate Motorsports Attraction," on the grounds of Daytona International Speedway. "These are the men who define the competition of our sport," said Bill France, president of NASCAR. "Their accomplishments are the benchmark that much of our history is identified by. Honoring them in this way, at the beginning of the NASCAR 50th Anniversary celebration, is one way of showing our true appreciation for them and the invaluable contribution they have given over the past 50 years. These are the drivers who made and make NASCAR fans stand on their feet and cheer. These are the drivers who are NASCAR history." An independent group of 50 individuals - drivers, team owners, crew chiefs, media members, track operators and others - participated in selecting the 50 greatest NASCAR drivers of all time. The voters were asked to give their objective and educated opinions on drivers from all NASCAR years, series and divisions. The chosen group of drivers will be the backbone to many NASCAR 50th Anniversary projects throughout the year, including television, online, publications, and other special projects. A key element of the tribute is the unveiling of a limited edition lithograph produced by PRESS PASS. The signed lithographs will be sold for $25,000 each, and are projected to raise $1,000,000 for charity. All contributions will be made in the names of all 50 drivers to the Make-A-Wish Foundation, Special Olympics, Leukemia Society, Speedway Children's Charities and Give Kids the World. 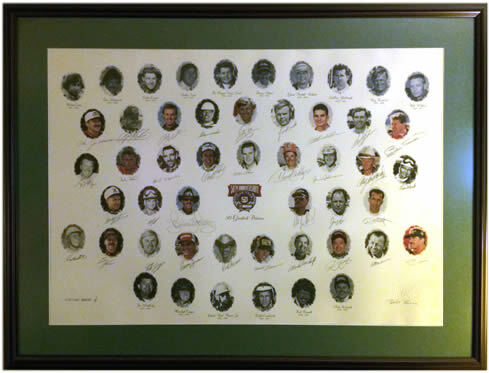 Tonight, one of the 250 lithographs produced, which are signed by each of the 34 living members of the 50 greatest drivers, will be auctioned with a starting price of $25,000. Proceeds from the auction will be donated to the Foundation Fighting Blindness in memory of T. Wayne Robertson, the president of R.J. Reynolds Tobacco Company's Sports Marketing Enterprises, who lost his life Jan. 14 in a boating accident. In addition, PRESS PASS has introduced a "retro" line of trading cards that will be a part of the company's 1998 PRESS PASS Race Cards race brand, a 150-card collection. The "retro" cards represent the 50 greatest NASCAR drivers and will be packaged with a single card in every two packs. The cards will feature a "retro" 2x3 size, uv coating and feature a foil stamping. The 34 living members of this select group will also be honored Feb. 15 during pre-race festivities for the 1998 Daytona 500 at Daytona International Speedway.